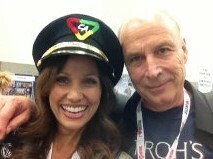 It’s always such fun when a friend texts you with, “I just heard your VO for the Captain Action Panel at Comic Con! You were amazing!! !” Gotta say, that made my day. G7 Animation is bringing back the 1960’s Captain Action series and I play Lady Action. Just waiting for the green light. Looking forward to some Action! Captain Action Promo. No Comments on "San Diego Comic Con"